It’s confirmed. Bill Willingham is a genius. Some of you knew this already. For those of you with no idea in the world who ‘Bill Willingham’ is, he’s an author/creator of the award-winning Fables graphic novel series. I recently began my exploration of graphic novels with a spin-off of the series, Cinderella: From Fabletown with Love. That one, while not written by Willingham himself, acted as enough of an enticement that I decided to read the entire series. Here’s my side of the story. Willingham’s novel Peter & Max was a far-and-away favorite of mine last year, but although I’ve done it before, I tried not to make a snap judgment about his genius until I’d read at least two representations of his work. With Fables: Legends in Exile, I’ve officially read (and LOVED) two Willingham creations. As far as I’m concerned? Case closed. 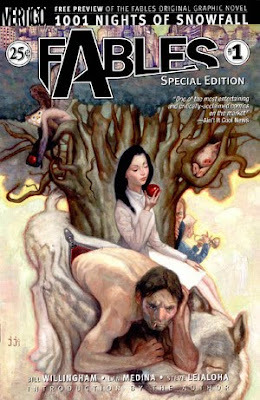 Fables (and its author) = made of awesome. When a savage creature known only as the Adversary conquered the fabled lands of legends and fairy tales, all of the infamous inhabitants of folklore were forced into exile. Disguised among the normal citizens of modern-day New York, these magical characters have created their own peaceful and secret society within an exclusive luxury apartment building called Fabletown. But when Snow White's party-girl sister, Rose Red, is apparently murdered, it is up to Fabletown's sheriff, a reformed and pardoned Big Bad Wolf, to determine if the killer is Bluebeard, Rose's ex-lover and notorious wife killer, or Jack, her current live-in boyfriend and former beanstalk-climber. As evidenced in the blurb, Legends in Exile is set up as a whodunit, with the mystery surrounding the death of Rose Red. Various fairy tale characters (Little Boy Blue, one of the Three Little Pigs, Prince Charming, etc.) make appearances, and their inclusion makes the story feel like a mash-up of the best kind. We already know some of these characters’ personality flaws and exploits, thus leading to an immediate sense of history and familiarity in the story and its protagonists. 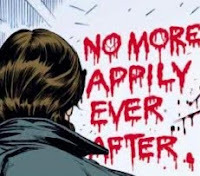 And yet, mixed in with that comfort of past history is the dark heart of the story and a set-up that is really interesting, and doesn’t skimp on modern ‘issues.’ There isn’t going to be a traditional happily-ever-after, just as we never get one of those in real life (shh…don’t tell the kids!). In this world, even princesses get screwed over, and their adventures aren’t always shiny and wonderful. It makes for some interesting and inventive reading, for sure. So, who did it? I won’t tell and spoil the secret. The mystery portion is very well done, and I actually had only a very bare inkling of what was going to happen, even though I had both visual art and written text for clues. In other words? The story is clever. And the set –up for the rest of the series – fantastic! I wish I had the next four or five volumes immediately. One thing I can’t forget is the artwork itself. It’s gritty in portions, absolutely beautiful in others (the individual issue covers, for instance), and definitely aided my appreciation of the story. Bigby wouldn’t have been himself without the ever-present stubble and cigarette burning. Who knew that Bluebeard was bald? And the fantastical creatures that every now and then take up a portion of a drawing are both fascinating and lovingly detailed. I will definitely look forward to more entertainment from this crew in the future! Recommended for: reluctant readers of any age (but especially teens), fans of comics and graphic novels, fairy tale aficionados, and anyone who can appreciate a sort-of happily-ever-after, as long as it is well told and the journey is enjoyable. Some questionable situations, so I’d rate it about a PG-13. This item counts for the Once Upon a Time Reading Challenge. I love FABLES! I still need to read PETER & MAX, however. I have the first volume floating around, and I once read the first few volumes at a bookstore when was I little, but didn't retain much. I am, however, really looking forward to it. I love Fables, too, but I've only read the first one, though. And I agree, this series is great for reluctant readers. hello monday! here, have a zombie update.